Corral panels, also called cattle panels, livestock panels, corral fence panels, are a kind of welded steel tube fence for cattle, horse and other livestock. It is made of high quality low carbon steel, so it has a good strength. We can provide different types corral panels and corral panel gate for you. Corral panels consists of round tube corral panels, square tube corral panels and oval tube corral panels. The quantity of the tubes can also be different. Main markets of our corral panels are Australia, European countries, Canada, America and Asia countries. ?The fence panel is made of steel, so the panel can stand against fierce strike of the cattle and horse. ?It is durable and has good corrosion resistance with galvanized or PVC coating surface. ?The panel is light, so it is easy to transport. ?The panel is easy to install without digging holes on the ground. ?The lugs are welded for all four sides, so it is very durable and safe. ?The panels with welded top caps will be waterproof and dust proof. We can see the corral panels welded lugs clearly. Two panels are connected by the pins. COP-1: Corral panels fixed by pins and lugs are stable. ?Zinc coating: more than 15 microns. ?Color: green, yellow, black or as your request. ?Accessories: 1 set need 2 rain caps, 2 "U" lugs, 2"L"lugs, 2 pins and 2 footplate. A corral fence stands on the ground of factory. The fence panels with round frame and six round horizontal tubes. COP-2: Round tube type corral panels are stable with solid welded points. Height: 1.6 m, 1.8 m, etc. Length: 2.07 m, 2.09 m, 2.1 m, etc. OD: 32 mm, 42 mm. Thickness: 1.6 mm. 1.6 m height with 5 tubes, 1.8 m height with 6 tubes. Square tube corral panel fences stand on the ground. The panels with square frame and six square tubes. COP-3: Square tube type corral panels. 40 mm × 40 mm RHS, 50 mm × 50 mm RHS. Thickness: 1.6 mm. Oval tube corral panel fence stands on the lawn. The panels with square frame and six square tubes. COP-4: Oval tube type corral panels with no sharp edges can decrease the hurt to the livestock. 30 mm × 60 mm oval tube, 40 mm × 80 mm oval tube, 40 mm × 120 mm oval tube. Thickness: 1.6 mm. Horizontal & Vertical tube: 50 mm × 50 mm RHS with fully welded caps. 40 mm × 80 mm. Thickness: 1.6 mm. Pipe: 50 mm × 50 mm. Thickness: 2 mm. A green PVC coated corral panel gate stands on the ground. The gate frame is welded onto the panel. COP-5: Corral fence gate will be stabler by welding with the fence panel . The galvanized corral panel with a gate stands on the lawn. The gate is installed with the fence panels with clamps. COP-6: The gate that is installed with the fence panels by clamps will be more flexible. 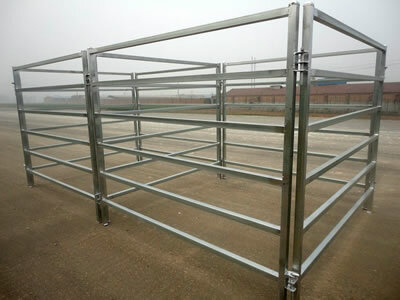 Corral panels can be widely used as the security fence for farm. With good strength, the panel can keep animals safe and protect your farm fields from wild animals attacking. A big horse and a small horse standing on the ground. They are surrounded by the black coated fence and gate. COP-7: Corral panels can be used to protect horse. A galvanized oval tube corral fence with a gate on the lawn and a cow in the fence. COP-8: Corral panels can be used to separate the livestock and protecting them. 1.Fence panel can be packaged with plastic film, wooden or metal pallet. 2.The accessories like the pins can be packaged with plastic film and carton box. 3.We can also pack them as your request. Car boot sale ad details Corral Panels are Strong Enough to Protect Livestock for sale in Wigan. Corral Panels are Strong Enough to Protect Livestock available on car boot sale in Wigan. More Other home & garden tools for sale in Wigan and more second hand sale ads for free on 2lazy2boot - Wigan car boot fairs - 42205.